​As I completed another trip to Malaysia to meet with the people in charge of certifying Malaysia’s palm oil industry, a few thoughts came to mind. What if the plane flew on biofuels? That would reduce the emissions from my flight for sure. Other thoughts were on the news reports that polar bears in Canada could become extinct due to climate change while a separate news report said that the Prime Minister of Canada will not commit to carbon cuts or saving marine areas unless the province of British Columbia agreed to export access for Alberta's fossil fuels. It struck me then that I could have the Malaysian palm oil industry implement sustainability practices and therefore save the orangutans but it would not save polar bears. Forests maybe a needed tool for fighting climate change but the quickest way from here to keeping global temperature rise under 2 degrees is to stop using fossil fuels. Yet, the plans to explore for more fossil fuels continues with countries like Canada, the USA and Norway. Its no wonder the UK’s meteorological agency has forecast that global temperature might flicker above 1.5C within the next five years. We have to stop pretending that its going to be OK to keep using fossil fuels as long as there are forests somewhere to absorb the emissions. "The largest source of GHG emissions within agriculture is enteric fermentation - when methane is produced by livestock during digestion and released via belches - this accounted in 2011 for 39 percent of the sector's total GHG outputs"
Available data on ghgs by economic sector shows that agriculture comes second to the production of energy for our homes as the two biggest source of ghgs. In light of nations placing economy before ecology and the refusal of the masses to give up meat, can we refuse the potential ghg savings from biofuels? Common sense dictates that the use of fossil fuels to produce energy be stopped. We have to keep it in the ground as the popular hashtag goes, or in the case of Norway, keep it in the ocean beds. Yet skewed or perhaps ignorant reports like those coming out of Rainforest Foundation Norway scare us away from using energy sources that can be grown. 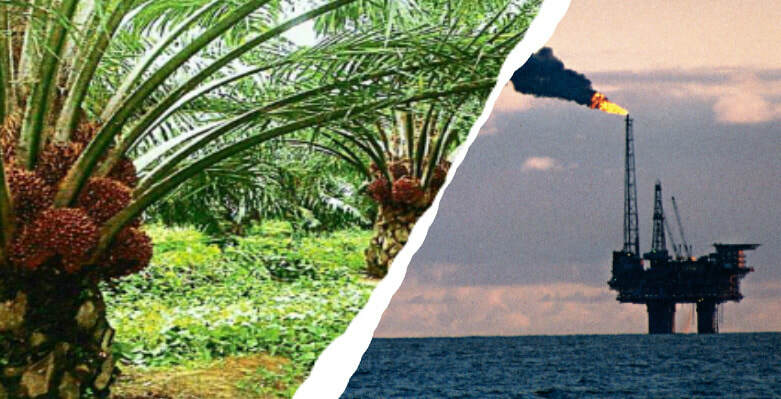 Addressing the Rainforest Foundations charges against palm oil-based biofuels for example. If China were to ramp up its use of palm oil for energy while Indonesia succeeds with its biofuel blend and the aviation industry starts using palm oil based jet fuels, the predicted usage of 67 million tons should be seen as removing 67 million tons of fossil fuels from being used. That is a good thing. Their forecasted 7 billion tons of C02 emissions spread out over 20 years due to forest loss for palm oil cultivation is nothing especially when compared to the emissions of the fossil fuel dependent USA which spews out 7 billion tons in one single year! For further comparison, the worst carbon emissions from Indonesias’s peat fires of 2015 was calculated at only 884 million tons and yet was written up as an ecocide. What does that make the emissions of the US? An important point to remember as well is that not all emissions are equal. If we look at methane gas which makes up only 10% of the US emissions in 2015, its global warming potential is estimated between 25% to 80% to that of carbon. So why is the emissions from biofuels being quoted to limit their use? The contentious issue of Land Use Change(LUC) or Indirect Land Use Change(ILUC) is what spikes the emissions calculations for biofuels like soy and palm oil but LUC and ILUC for biofuels paint only one corner of the whole picture for land use. If a forest was cleared for soy or palm oil, can we justifiably attach the emissions to biofuels without knowing if the clearance was to supply biofuel or feedstock for meat animals? What if the continued use of non palm oil biofuels leads to the diversion of other vegetable oils from food supplies to biofuel and increases the demand for palm oil as a food oil which consequently leads to deforestation? Should we add the emissions from the loss of those forests to non palm oil biofuels? On the flip side, can we attribute the recovery of forests in China and India to the decreased need for farming in these countries? India which remains the world’s biggest importer of palm oil at over 9 million tons would be hard pressed to reach its goal of adding 12% of its lands to forests if it had to grow vegetable oils for its own consumption. The same can be said of China, the world’s third largest importer of palm oil and one of the biggest importers of natural resources globally. Its ability to reforest its own lands is simple case of transferring its deforestation to other countries. So, can we apply this positive LUC or ILUC attribute to soy from the Americas and palm oil from Southeast Asia? After all, forest gain in China and India can be directly attributed to having excess lands from not having to grow 100% of their own needs. An interesting study published recently in Nature Sustainability looked at providing a good life for all within planetary boundaries. The gist of it is that there aren’t enough resources for all seven billion humans, that developed nations must reduce their consumption in order for the poorer nations to develop. This is highly unlikely to happen as no nation would willingly submit itself to a regressive state in order for others to progress. Rather than pointing excitedly at the threatened loss of more forested areas, we should look hard for global solutions which could be as simple as, you need development, we all need clean air but polar bears and orangutans must be saved. What can we do together?